Track-It, a state-of-the-art intelligent transportation system, provides AVTA customers with real-time bus location information. The $2.4 million system monitors AVTA's entire fleet of local and commuter buses via a Global Positioning Satellite (GPS) tracking system. AVTA passengers can now rely on 24/7 access to bus departure information using their smartphones or computer. When a bus is delayed or detoured due to roadwork or other causes, customers will be able to track the bus’s progress on the route. Passengers will also be able to receive text alerts notifying them of an upcoming bus departure, making trip planning easier than ever before. The Track-It system is equipped with cell/SMS/text capabilities, so mobile phone users without the application can request and receive bus information via text message. Simply text "AV" plus the bus stop number to 321123 and departure information will be replied back to you. 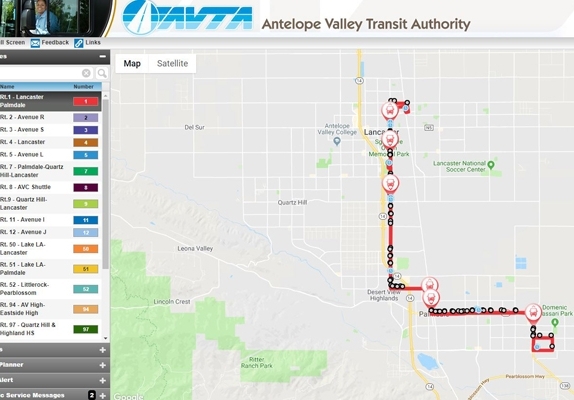 Customers can also visit the AVTA website home page or go to http://track-it.avta.com, where a computerized map will show the current position of each bus, tracked by GPS. In compliance with the Americans with Disabilities Act, Track-It enables AVTA buses to now have automated announcements of upcoming stops on each route. AVTA has also installed digital signs at Sgt. Steve Owen Memorial Park and at the Palmdale Transportation Center, that display updated bus departure information, and soon, Track-It signs will be posted at bus stops, to help passengers with smart and regular cell phones easily obtain bus location information. AVTA's Track-It provides real-time bus departure information for every AVTA bus, on all routes in the transit system, and for every bus stop! AVTA has upgraded its entire fleet with Global Positioning Satellite (GPS) receivers to facilitate the new Automatic Vehicle Location (AVL) system. Each AVTA bus stop has a unique identification number located at the bottom of the posted bus stop sign. Passengers can access departure information via the options described above by inputting the proper number associated with the particular bus stop; thus eliminating the need to navigate through multiple routes, time, etc. With Track-it, information for every bus in service is transmitted to AVTA Operations through cellular communications. This information is immediately available to provide real-time departure information and is archived for scheduling, route planning, reporting, and performance analysis. Departure information will also be displayed on digital signs at the Palmdale Transportation Center and at Sgt. Steve Owen Memorial Park.